The research methodology adopted by Persistence Market Research is a strong combination of in-depth secondary research and extensive primary interviews with key industry stakeholders and domain experts to gather the necessary data and information pertaining to the specific market being researched; followed by a multi-layer validation of the gathered data to glean pertinent market insights capable of impacting critical business decisions. This exhaustive methodology has been followed during the study of the global aircraft window & windshield market and the findings and insights have been presented in a systematic manner in the global aircraft window and windshield market research report. 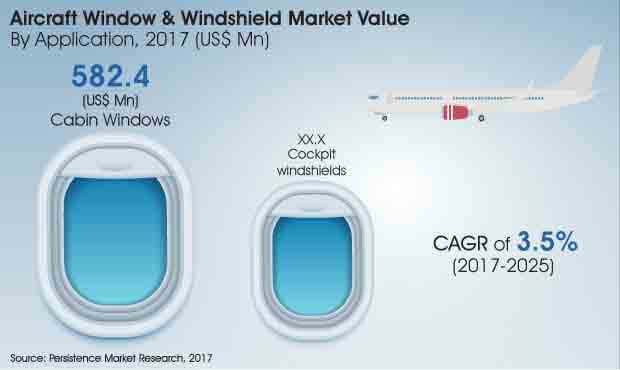 The global aircraft window and windshield market reflects a steady growth path growing at a value CAGR of 3.5% during the forecast period. According to the market forecast, aviation market has boosted the demand for both cockpit windshields and cabin windows of aircrafts. There are different types of aircrafts in the market like small body, wide body, very large boy aircraft and regional aircraft. The continuously increasing aircraft numbers globally will directly impact the demand of window products. Also, the increasing per capita consumption in emerging countries has led to increase in the airline passenger traffic. This, in turn, has increased the intake among aircraft manufacturers which in turn has been a driving factor for the global aircraft window and windshield market. The market analysis shows that among different applications, cabin windows segment leads with a high margin, as it is expected to reach a market value of over US$ 770 Mn by the end of 2025. The segment also leads in terms of CAGR, with an expected rate of 3.6% during the forecast period. Thus, cabin windows application segment is expected to drive overall growth of aircraft window & windshield market. Aircraft deliveries coupled with rising defense spending have major impact over demand. There are continuous advancements taking place in the aircraft windows and windshields. Aircraft OEMs are replacing traditional pull-down plastic shade window with larger dimming windows that can be adjusted to let in desired quantity of light. One of the most notable collaborations for the development of these windows is between Gentex and PPG Aerospace. The new window enables controlling the window by the passengers through a transparent color video touchscreen on the window or directly by the crew through the flight attendant panel to regulate light and heat, reduce noise inside the cabin and other services. New innovative products can help airlines build their brand image by offering creative tailored use of this new interactive passenger amenity and can also maximize revenue as a result of increased value of window seats. European carriers are currently driven towards more efficient planes for reducing fuel costs as well as to comply with the EU’s Emissions Trading System, the cap-and-trade scheme designed to cut greenhouse gas emissions. Moreover, airlines have been taking steps to cut fuel consumption by switching to lighter interior component products, which will also boost the demand for aircraft windows with less weight. The aircraft market is demanding an increase in the replacement of aircraft windows and windshields. According to an estimate by the leading aircraft manufacturer, Airbus, it is projected that nearly 11,000 passenger aircrafts need to be replaced, largely in the single-aisle segment in the next two decades. Operating efficiency and the revenue requirements of the operating airlines is driving the need for replacement of aging fleet of commercial aircrafts. Emerging environmental concerns, new regulations and airspace modernization will also contribute to larger backlog of aircraft orders.